In a story that is as old as sport itself, the closest of team-mates are now the greatest of rivals. This will certainly be the case in the seas off Hampshire next week as British Olympic hero Sir Ben Ainslie and his home-based Land Rover BAR team start the long journey to win the America's Cup for Britain for the first time in its history when they line up against Jimmy Spithill and his Oracle Team USA. Australian Spithill has led Oracle Team USA to two consecutive cup victories, most famously including a n amazing comeback against Emirates Team New Zealand in 2013 in San Francisco Bay with Ainslie as a team-mate. Now, one week ahead of the first races of the Louis Vuitton America’s Cup World Series –the 35th America's Cup cycle - the two fierce competitors are squaring up and rivalries are being stoked. Ainslie dismissed Spithill’s single-handed gibe saying that he had spent a large part of his career being part of America’s Cup teams and knew how to build a successful team. Despite the rivalry the mutual respect is also evident. Ainslie is equally full of admiration for Spithill describing him as “a machine”. A seam of determination runs through both men but Ainslie has been clear in his determination to bring the cup to Britain. Amidst all this talk of the UK-US rivalry, it should not be forgotten that there are four other teams taking part that may well have a say in proceedings. 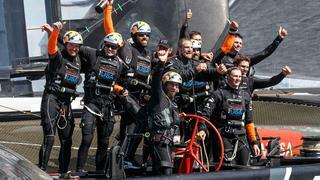 Emirates Team New Zealand has turned over its race crew to a younger generation, with Peter Burling taking the helm. The first winner of the Red Bull Youth America’s Cup is on fire with an unprecedented string of victories in the 49er class as he simultaneously campaigns for the 2016 Olympic Games. The man he replaced, Dean Barker, didn’t sit on the sidelines for long. Barker bounced back as the CEO and skipper of SoftBank Team Japan, making its America’s Cup debut in Portsmouth. Artemis Racing will be led by Nathan Outteridge, who turned heads in the last America’s Cup for his ability to coolly step into his first America’s Cup campaign and assume a leadership role. An Olympic gold medallist, Outteridge is far from unique on an Artemis Racing team stocked with medal-winning sailors. And Groupama Team France will be flying with Franck Cammas, the French multihull veteran who has won every race, and broken every record, he has set his mind to. Will the America’s Cup be next?